What can I say about the swimming? 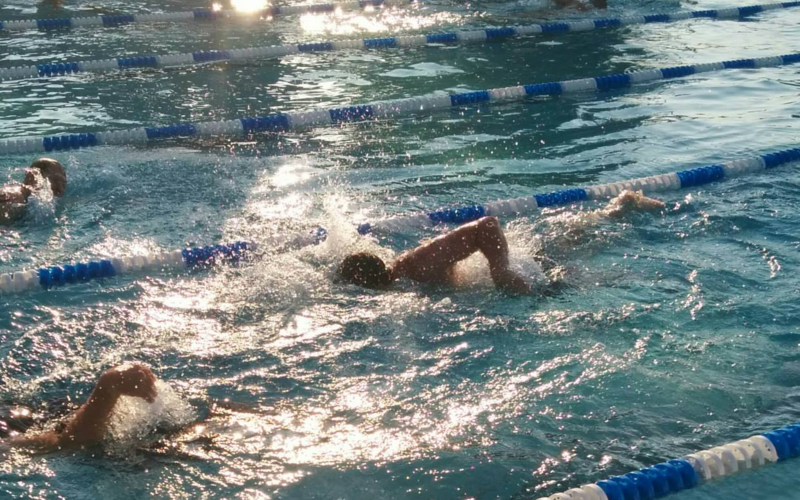 I’m not a competitive swimmer by any stretch of the imagination. With such a short distance to traverse, I still thought that I could steam roll through the swimming without much issue. I had trained/practiced enough in the latter part of 2014 such that I really thought my form and breathing would be adequate. Before even hitting the pool, anxiety about the swim started to set in. I don’t know why this was the case, but it got my heart rate up to the extent that my heart was racing. Once in the pool, I simply couldn’t adjust. My breathing was erratic which made holding my breath difficult. I had to make due and get through he event though. My overall time for the swim wound up being around nine minutes which is very slow. I kept telling myself to push through, and forget about placement. I knew that I had the potential to make up time later on the bike and run. I almost look like I know what I’m doing! One unique aspect of the swimming route is that it included both an indoor and outdoor pool. I liked like how the route involved snaking through the lanes. I was also relieved to not be the last one out of the pool. 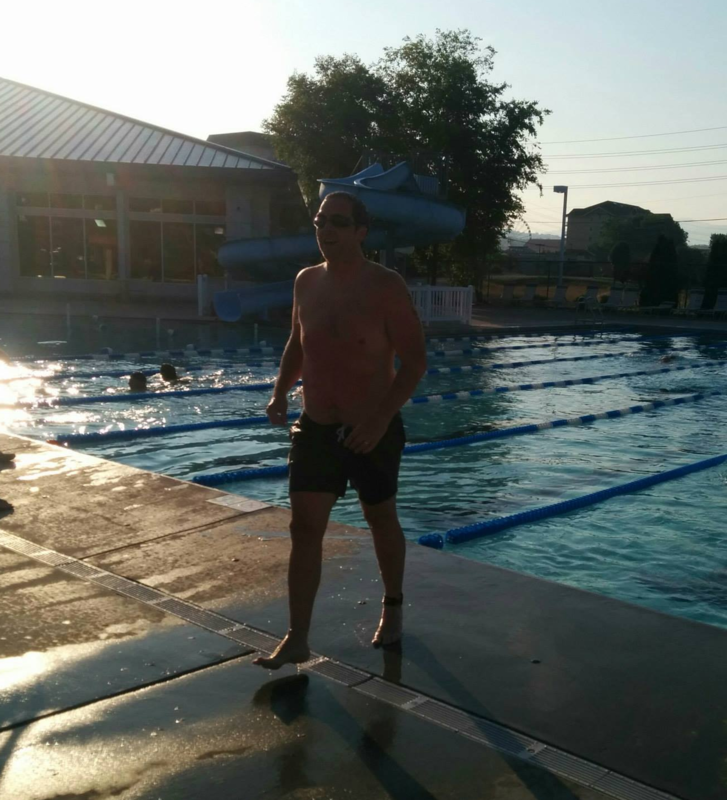 In transition, after exiting the pool, initially, I felt pretty spent. I took a little extra time in the T1 transition to catch my breath, hydrate, and clear my head. This wound up being a 2 1/2 minute breather, essentially. The bike beckoned, though, and I was off. 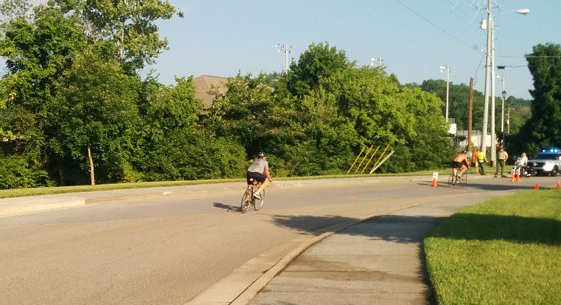 Elevation wise, the bike ride was like most any other out-and-back bike route in Knoxville. The first half was up and the second half was down. The bike ride was pleasant as it rolled through wooded areas on back country roads. With ridges all around, shading was good, it was relaxing, and I enjoyed it. The elevation chart looks kind of like a pyramid. I pushed myself as much as I could and wound up with an OK 16.7 mph average pace and overall time of 58 minutes. This was one of the high points of the triathlon for me since it was significantly faster than most of my training rides. Most of my training rides averaged about a 15.0 mph pace. Through the bike ride, I had (2) people pass me while I passed, iirc, at least (7) people. I caught one of the guys who passed me also as we rolled in the T2 transition. This really got me pumped. Racing to the T2 transition with my target in sight! My T2 time was brief. I only had to put my bike on the rack, toss off my helmet and gloves, and run. 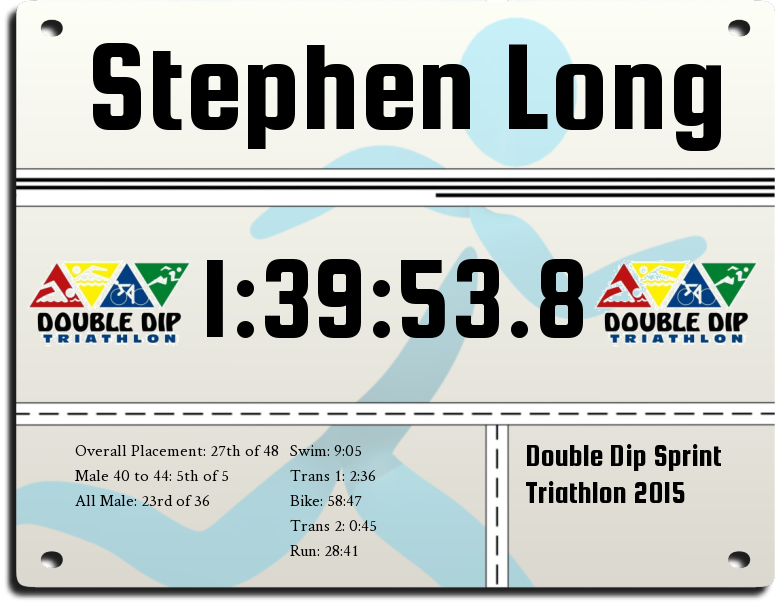 Overall time was less than a minute in T2. The run was an odd looping “T-shaped” route which consisted of two loops. My legs were wobbly as I started out, and I don’t feel like I ever really got a good rhythm going. On most of my training runs, I experienced this as well, so I just did what I could. Fatigue played a big factor in the run for me. There were a number of times that I wanted to stop running and just walk for a bit. I refused the notion though, and just kept moving. Looking back at my split times, I slowed to about a 09:30 pace on the 2nd mile, but never walked. 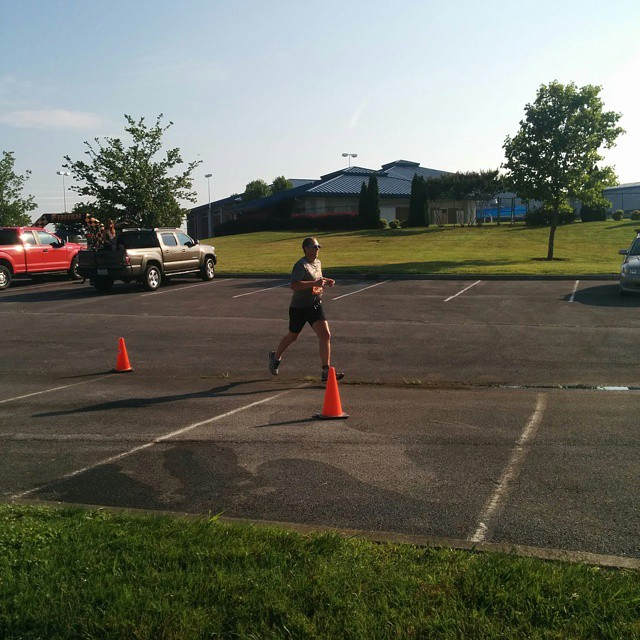 My overall pace was around 09:05 min/mile. 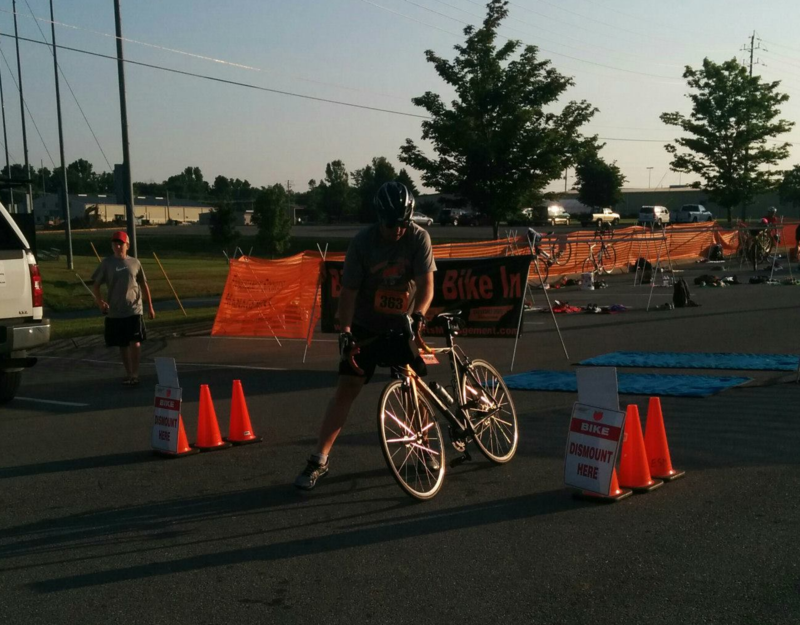 Through the run, I passed 3-4 more people, including the one biker that I caught at the T2 transition. Something else different about the run was the heat factor. I’ve run many road and trail races and never had an issue with heat. 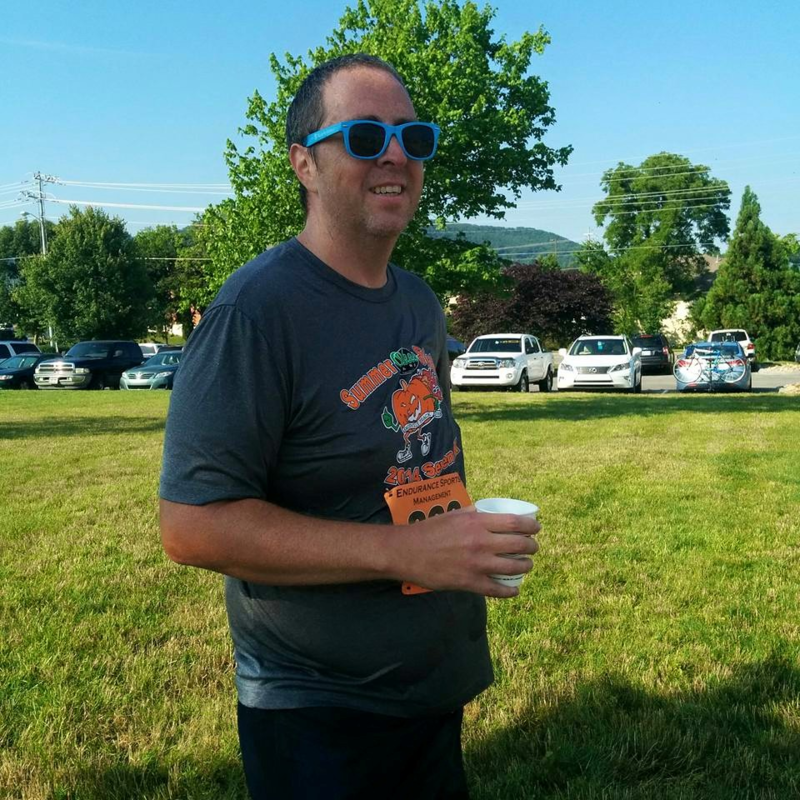 However, during the run, I grabbed water numerous times at the aid stations and dumped them on my head. In hind sight, I noticed this effect in my own “brick” training once off the bike and onto the run as well. Rounding into the finish, I didn’t have much left to give, but I picked up the pace as much as I could. It wasn’t exactly a thrilling, sprinting finish, but I did manage to get my pace at the end below the 09:00 min/mile pace mark. My wife and children were there at all of the turns/transitions to cheer me on. Hearing their cheers and words of encouragement were very timely motivators for me! With this new experience under my belt, I know what areas of fitness I need to work on. Swimming has to be a bigger priority for me if I want to continue participating in triathlons, but I also have to learn to make my body transition better when going from biking to running. The body doesn’t want to abide, but it can be persuaded. 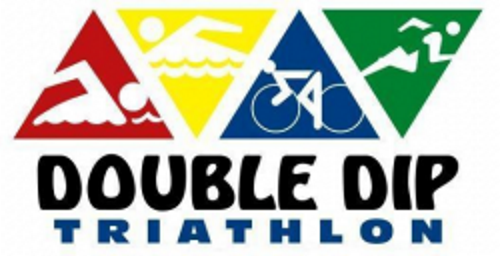 Triathlons are far different than running alone, obviously. Even at only a sprint distance, I think this event is comparable, but slightly harder, than a half-marathon. Changing up between events kept things fresh and fun. I see myself doing more triathlons in the future and would like to work up to at least a half ironman. Drenched in sweat, but pleasantly satisfied after crossing the finish!